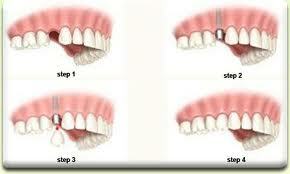 Traditionally, when a tooth was lost, a fixed bridge was the treatment of choice. With a fixed bridge, the teeth on either side of the missing tooth are drilled down for crowns. The missing tooth is then connected to the crowns, and the 3-piece bridge is cemented into place. Dental Implant Technology now enables you to replace missing teeth without the need to drill any other teeth. The implant replaces the missing natural tooth root, and the replacement tooth is attached directly to the implant. Your new tooth will look, feel, and function much like the natural tooth that it replaces. Implants are by far, the best way to replace missing teeth. The implant is surgically placed into the bone at the location of the missing tooth. Then an "abutment" is screwed into the top of the implant. Lastly, a replacement tooth is cemented to this abutment. Your new tooth will look and function like one of your own healthy natural teeth.